Fluent software contains the broad, physical modeling capabilities needed to model flow, turbulence, heat transfer and reactions for industrial applications. These range from air flow over an aircraft wing to combustion in a furnace, from bubble columns to oil platforms, from blood flow to semiconductor manufacturing and from clean room design to wastewater treatment plants. Fluent spans an expansive range, including special models, with capabilities to model in-cylinder combustion, aero-acoustics, turbomachinery and multiphase systems. Provides a complete, single-window solution within Fluent. Streamlines the Fluent workflow for generating a mesh from imported CAD. Removes barriers for common tasks that frustrate users. Fluent has a new look that’s easy on the eyes. Users can pick from several themes or chose the new, Japanese language localization. Fluent’s task-based workflow guides users through an organized simulation process that offers the most accurate results in less time. At each step in the process, the software provides the most relevant design options or defaults to a best-practice option. Benchmark data show that users complete the workflow with 70 percent fewer clicks and 50 percent less hands-on time. 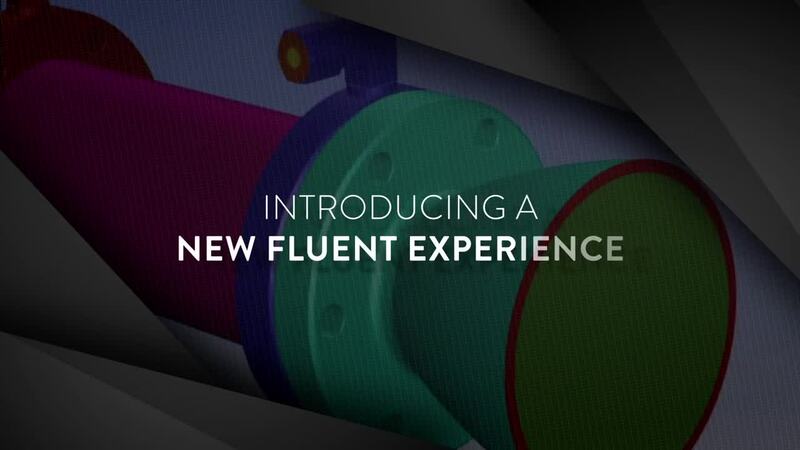 The New Fluent Experience dramatically speeds the time to an accurate solution, while freeing engineers to do more with less training. I tried Fluent’s Task-based Workflow. Here’s What I Found. ANSYS Fluent software contains the broad physical modeling capabilities needed to model flow, turbulence, heat transfer, and reactions for industrial applications—ranging from air flow over an aircraft wing to combustion in a furnace, from bubble columns to oil platforms, from blood flow to semiconductor manufacturing, and from clean room design to wastewater treatment plants. Fluent covers a broad reach, including special models with capabilities to model in-cylinder combustion, aero-acoustics, turbomachinery and multiphase systems. Now engineers can easily leverage cloud computing to speed their simulations by submitting jobs directly from their Fluent desktop. Volkswagen Motorsport shattered the time record at the Pikes Peak International Hill Climb with their first-ever, fully electric race car, the I.D. R Pikes Peak — a next-generation race car developed with ANSYS simulation solutions. Volkswagen Motorsport engineers conducted complete virtual drive tests of the entire race and optimized the battery cooling system with minimal weight and aerodynamic drag loss. Keelwit Technology is a Spanish engineering consultancy company founded in 2011. The company designs, develops and implements technology projects using a different yet realistic approach. Keelwit focuses on three areas: energy efficiency, sustainable mobility and fluid mechanics. They have been using ANSYS CFD on many client projects to solve highly complex engineering problems. Watch this video to hear from Keelwit’s co-founders and partners, Isaac Prada y Nogueira and Jose Maria Cancer Aboitiz, about their experiences with ANSYS, particularly focusing on building the largest vertical wind tunnel to study skydiving conditions. The large structure required complex thermal and aerodynamic analysis, with ANSYS CFD used to simulate more than 50 operating conditions.